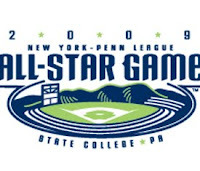 Tonight is the 2009 New York-Penn League All-Star Game from Medlar Field in State College, PA. The Hudson Valley Renegades will be represented by Mark Thomas, Tyler Bortnick and Alexander Colome. The evening kicks off with the Celebrity Home Run Derby in which the top sluggers from the New York-Penn League and past MLB and Penn State athletes will do battle in a home run derby. The American League team will be represented by Neil Medchill (Staten Island and leading home run hitter of AL), John Wehner (former Pirates and Marlins), Chris Bahr (former Penn State kicker) and Al Bumbry (1973 AL Rookie of the Year). The National League will be represented by Brock Holt (Staten Island and NL HR leader), Sid Bream (Spikes hitting coach and former major leaguer), Robbie Wine (Penn State baseball coach and former Houston Astro) and Justin Kurpeikis (former Penn State defensive end). The All-Star Game will follow the home run derby with first pitch scheduled for 7:15pm. The American League is led by honorary manager Al Bumbry and Travis Fryman (Mahoning Valley) consist of: P Alexander Colome (Hudson Valley), P Jose Alvarez (Lowell), P Francisco Rondon (Staten Island), P Kenny Faulk (Oneonta), P Cory Burns (Mahoning Valley), P Egan Smith (Auburn), P Marty Popham (Mahoning Valley), P Jacob Smith (Aberdeen), P Adam Warren (Staten Island), P Clayton Cook (Mahoning Valley), P Yeiper Castillo (Lowell), C John Murrian (Oneonta), C Sean Ochinko (Auburn), C Mark Thomas (Hudson Valley), 1B Rawley Bishop (Oneonta), 1B Chris McGuiness (Lowell), 2B Derrick Gibson (Lowell), 2B Jimmy Paredes (State Island), 3B Levi Carolus (Aberdeen), 3B Tyler Kelly (Aberdeen), SS Tyler Bortnick (Hudson Valley), SS Carmelo Jaime (Oneonta), OF Michael Rockett (Oneonta), OF Zolio Almonte (Staten Island), OF Jordan Henry (Mahoning Valley), OF Welington Ramirez (Auburn), OF DeAngelo Mack (Staten Island), DH Ryan Westmorland (Lowell). The National League is led by honorary manager Kent Tekulve and Pedro Lopez (Brooklyn) will consist of: P Mitchell Clegg (Vermont), P Michael Powers (Brooklyn), P Philip Irwin (State College), P James Fullers (Brooklyn), P Austin Hyatt (Williamsport), P Mark Cohoon (Brooklyn), P James McDonald (Tri-City), P Zachary Foster (State College), P Evan Bronson (Vermont), P Santo Maertz (Batavia), C Sebastion Valle (Williamsport), C Luis De La Cruz (Batavia), C Doc Doyle (Brooklyn), 1B Sam Honeck (Brooklyn), 1B Francisco Murrillo (Williamsport), 2B Brock Holt (State College), 2B Francisco Soriano (Vermont), 3B Alan Ahmady (Batavia), 3B Chase Austin (Jamestown), SS Jeremy Barnes (Williamsport), SS Sean Nicol (Vermont), OF JD Martinez (Tri-City), OF Kyle Jensen (Jamestown), OF Sequoyah Stonecipher (Jamestown), OF Leandro Castro (Williamsport), OF Rand Smith (Jamestown), OF Luis Rivera (Brooklyn), OF Russell Dixon (Tri-City), DH Brian Kemp (Tri-City).